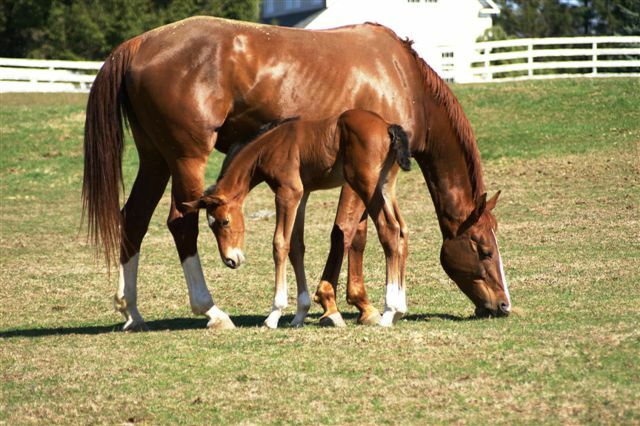 Rolling Stone Farm is proud of the accomplishments and quality of Gold Luck foals. 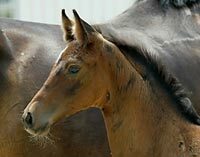 In just a short time they have collectively achieved many top foal awards and placings at inspections and recognized breed and performance shows. 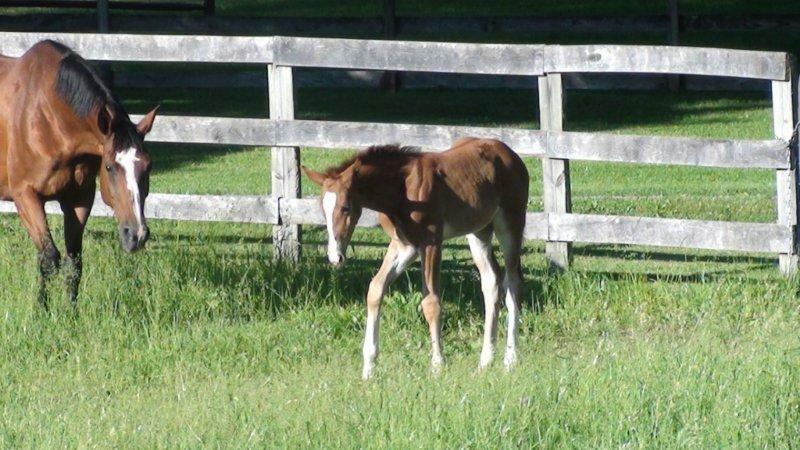 Below is a listing of Gold Luck foals included on this site. 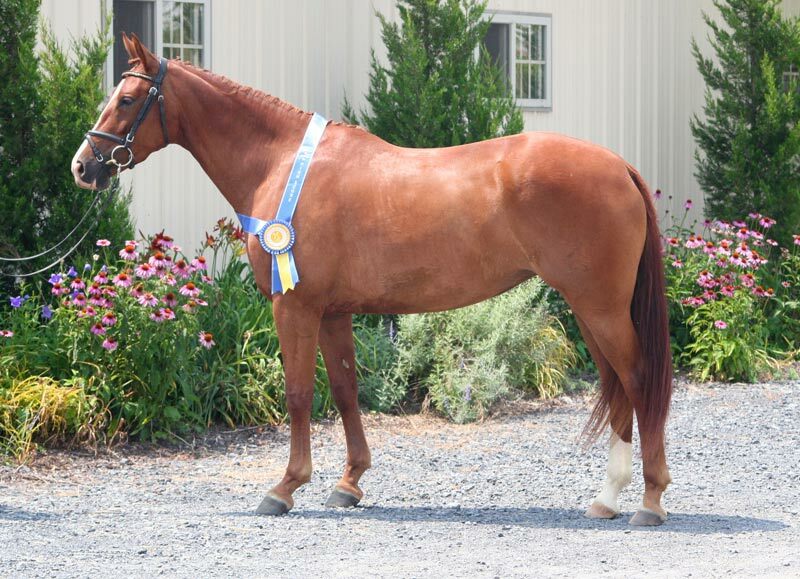 2002 Chestnut Mare by Gold Luck. In 2005, Ghamma Ray ranked fourth highest of those mares qualifying for the Walter Hartwig award. This award is given for North American bred and born young mares which achieve the highest combined scores on their studbook inspection and Mare Performance Test (MPT), both taken as a three- or four-year-old. RSF horses have made the list ever since its inception four years ago (we won the inaugural year with EM Dew Berry). Ghamma Ray also received the Benchmark award for 2005, tying for the highest free jumping score for the nation (9 and 9) for the 2005 mare performance tests. Dam, Poppaea is out of a full sister to Argentan. Grandam Worms was a German Championship (DLG) class winner and overall vice champion. Poppaea's full sister, SPS Prinzessin Asta, is dam of SPS Fenjala, by Fabriano. 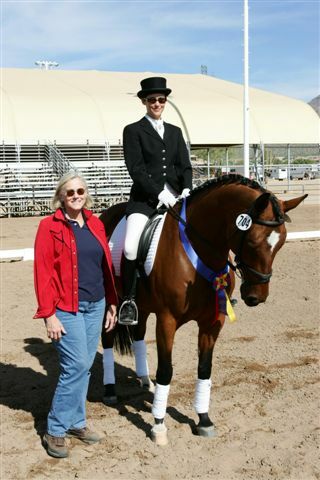 In 2002, Fenjala added to her many past achievements at mare shows by earning the champion title in the 4- to 6-year old division at the prestigious Ratje Niebuhr-Schau. SOLD! Congrats to Kristen of VA! Well, Nov. 5th was a great day for Ghenna and Sandy. In the mare inspection sponsored by the MAHB club, she was named the high score Hanoverian mare with a very high score of 7.56. She received 8's for head, neck, typiness/femininity, impulsion/elasticity and overall development and 7's for saddle position, frame, foreleg, hindleg, correctness and walk. Then in the mare show, she first in the 3yo class, Champion Hanoverian, Reserve Mature mare (topped by Sandy Johnson's nice Dutch mare Opus 12 by Rubinstein/Rampal), then she caught her energy back and had another nice go in the championship class and was named overall Grand Champion. SOLD! Congratulations to Sandy Werkheiser, Northampton PA! 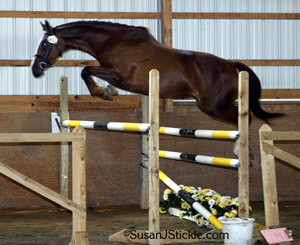 2004 Rolling Stone Farm inspection - High scoring mare in the free-jumping (scores 8,9) was Ghloria, a six-year-old Gold Luck-Elation/Equuleus daughter, owned by Mo Swanson and presented by future owner Liz Hurley, Chesapeake City, Md. Ghloria completed her MPT with a score of 6.83, and as she had previously produced an AHS registered foal is now a new Elite Mare. SOLD! EM Ghloria was sold and is now owned by a new adoring person. She will most likely be bred back to DeLaurentis. This was a very successful cross. At the MAHB HN inspection and MPT 11/5 & 6/ 2006, she was re-inspected and received a score of 7.14 and was performance tested where she received a 7.61, the second highest score (right behind Whindlass). On her inspection, she received 8's for forelegs and correctness of gaits, 6's for saddle position and frame and all other scores were 7's. In her mare performance test, she received an 8 and a 9 for the free jumping, 7.5 for rideability, 7 for walk and canter, and 6.5 for the trot. We think she will make a super riding horse for a junior or smaller adult who wants to do jumpers or dressage. Client Listing Congratualtions to Jeannette LeRoux of VA! Giadonna has the distinction of being the only horse my husband ever bought. I had requested a videotape of her going under saddle and was quite impressed. While I was in the hospital, Jim purchased her as a surprise for me. In 2001 as a four year old, she was inspected, scoring 7's straight across the board. She also did the MPT at the same time and here is where what I had seen on the tape came through. She scored a total of 7.61 with 8's for rideability, trot, and jumping ability. All the other scores were 7's. She received the high score MPT ribbon for our site. SOLD! Congratulations to Gigi Pindar! 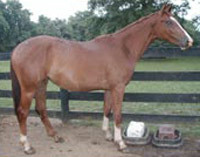 Dark brown mare by Gold Luck out of State Premium Dementia (see Rhiviera below). Ghrenadine is a new Elite Mare Candidate, scoring a 7.5 on her studbook inspection, tying the score for the top mare with another Rolling Stone Farm horse. She passed her Mare Performance Test with a 7.16 after being under saddle only 75 days, receiving scores of 9 for jumping ability and 8 for jumping form. She is elegant and has a wonderful attitude under saddle. SOLD! Congratulations to Judy Buscher of Elkhorn, NE! A happy mother's day at RSF! It started out at 4 am with a filly from Dew Berry. 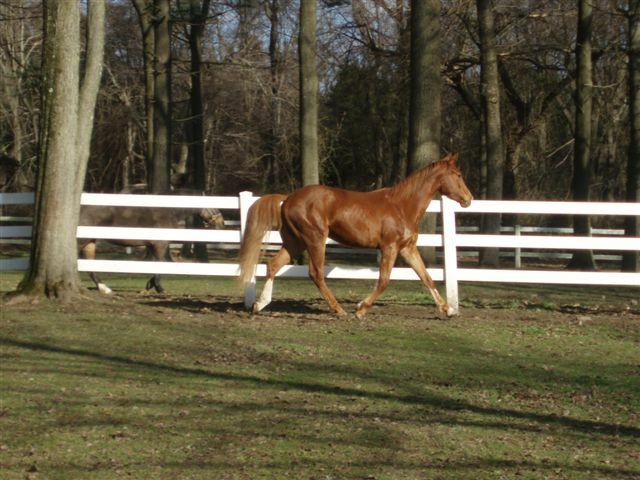 She is chestnut with a blaze and 3 white legs. She is really beautiful, and is healthy and strong and correct. We have named her Ghypsy. 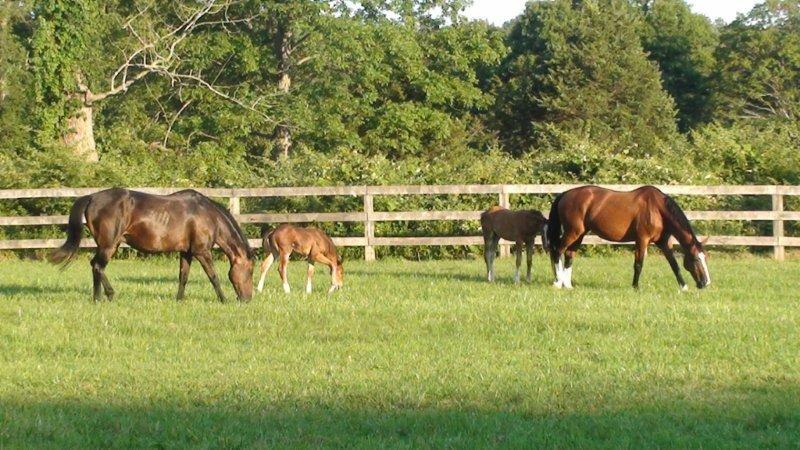 Pinch me; this is such an awesome foal crop so far! SOLD! Congratulations to Lyn Francik, Oklahoma on 2005 purchase #2! 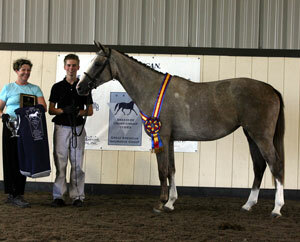 Received a Premium Foal Award and Reserve Championship at his Oldenburg inspection. By Gold Luck out of Elation (Equuleus-Grundspecht). 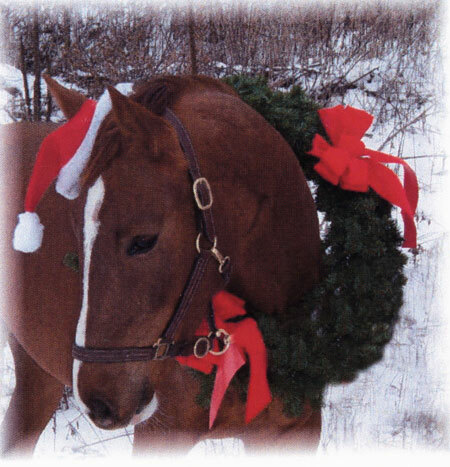 Chestnut, blaze, 4 stockings. Dam Elation has produced a filly by Gold Luck that was given an "8" for gaits and overall impression at her inspection by Ludwig Christman of the German Hanoverian Verband. 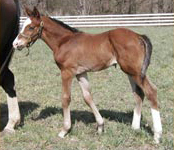 Another of her fillies by Gold Luck was named one of the top three foals at the Pennsylvania AHS inspection. Elation has also produced a mare that was an overall "8" at her mare inspection. She herself was an event horse. SOLD! Congratulations to Steve Ruggiero and Tracy Kettunen on their second purchase of a Gold Luck offspring! Chestnut colt by Gold Luck. SOLD! Congratulations to Jennifer Hewitt, WI! Chestnut filly by Gold Luck. Champion filly at her foal inspection. 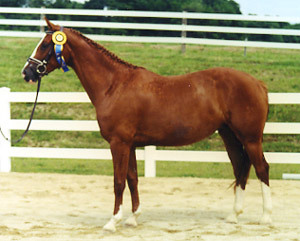 Ghabor became elite eligible in 2003 when she passed her mare inspection with a score of 7.16. Ghabor has joined the Marefield Meadows breeding herd. Bay colt by Gold Luck. Now under saddle and receiving rave reviews! Ghalena was euthanized in February 2004 after being severely injured in a freak stall accident. Condolences to owner Dana Wirth on a hard decision. Best wishes and good luck with her new horse Ghravity - also a RSF filly. 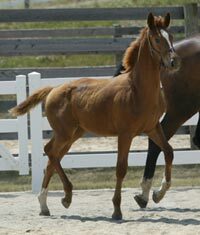 "Ghale" is a chestnut filly with a blaze and four stockings. Her father's daughter. Excellent conformation, tall and spectacular movement. SOLD! Congratulations to Kris Schuler, Fleetwood, PA! 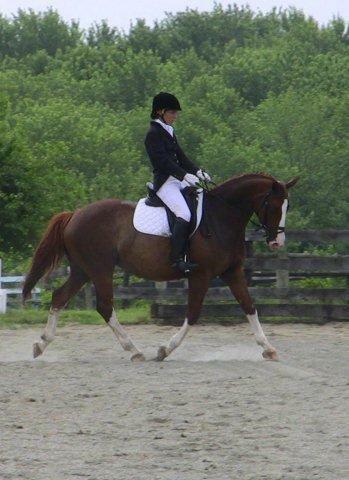 2002 Hanoverian Gelding, Chestnut, 16.2 Ghalileo, or Leo, is now schooling all Second level movements and will be shown in 2009 at First and Second levels. 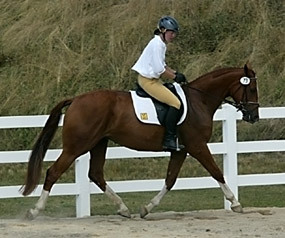 In 2008, his first year of showing, Leo qualified for the BLM Championships at both Training and First levels. 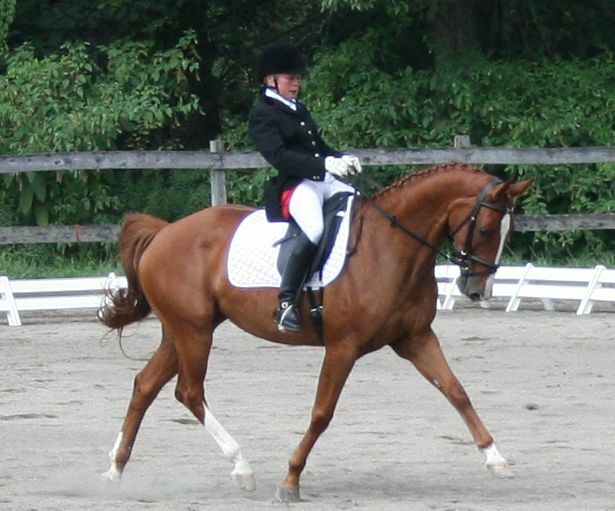 He also won the high score trophy at both Training and First levels for Virginia Dressage Association – Charlottesville, based on the consistently high scores he obtained all year. 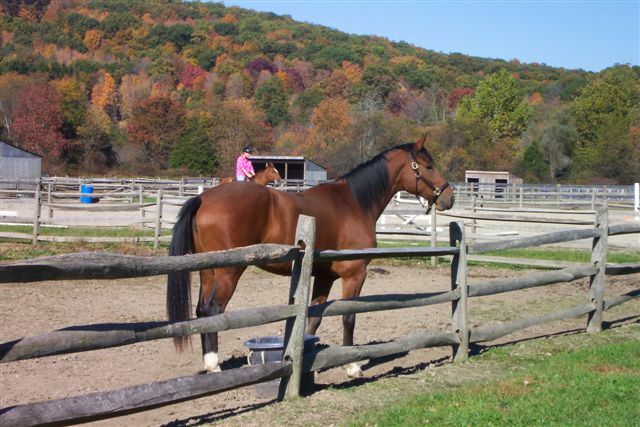 He's easy and fun to ride; perfect for the amateur rider. 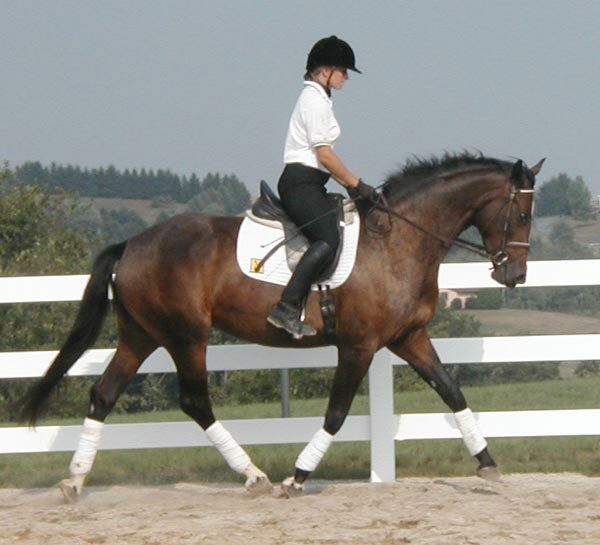 He is a very nice mover with big gaits and excellent, natural rhythm and a laid-back attitude. He is nicely forward and quiet with an agreeable temperament. At a recent clinic with well-known S judge, Jeanne McDonald, he received the following comments: "this is the horse everyone wants to own--3 good gaits and a nice temperament." 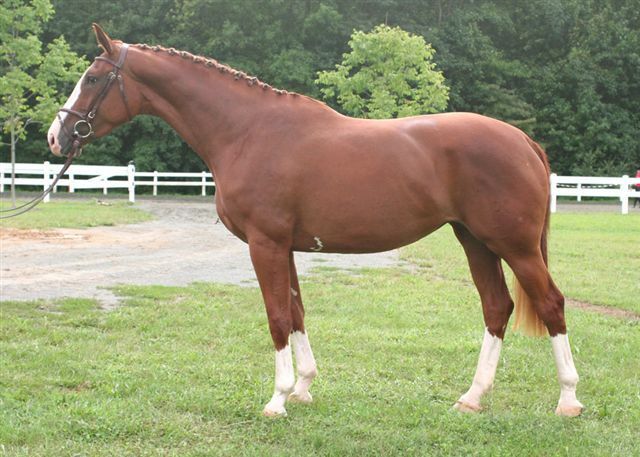 Leo's full sister is Elite Mare Gharbo (see RSF site for information). His other full sister was Ghin and Tonic (see tribute section). Leo's dam, Poppaea, is out of a full sister to Argentan. 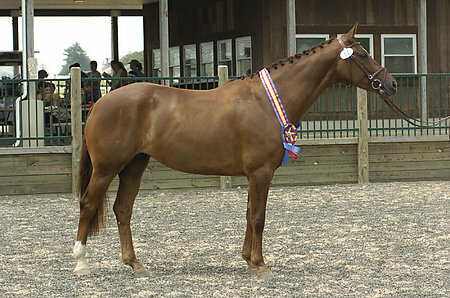 From his dam's side, his 2003 half sister, Fleuret, was Grand Champion of the VADA/Nova Breed show, 6/7/06 and his 2001 half brother, Fhinland, was an inspection site colt champion and went on to be presented as a stallion prospect. A fancy bay colt with a star and four socks by Gold Luck out of Whichita (Waltzertraum/ Adlerblick/ Einglas). 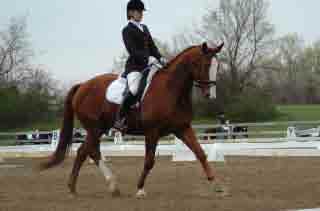 Waltzertraum was Champion Young Horse at Dressage at Devon in 1995. He is successfully competing at Grand Prix dressage. 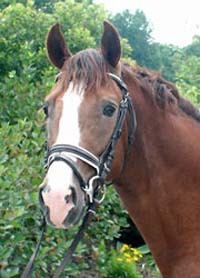 Whichita is out of my wonderful foundation mare, Adelblume, and is one of her replacements in my broodmare band. Dr. Brockmann quite liked Whichita at the inspection when we brought her and her 2002 foal in the ring for the inspection. A good mover, "Leon" will be quite tall like his dam. 2003 Bay filly by Gold Luck. Ghalley broke her femur in a pasture accident. We will miss her sweet face.